The Aprilia MY2017 Dorsoduro 900 Supermoto is an incredibly fun bike offering the best performance at all times. This supermoto is built to ensure the best riding pleasure to ensure full riding fun. The use of advanced technical solutions, agile and quality components guarantee that this supermoto will provide the best performance at all times. It is truly a special bike featuring an efficient chassis architectures having high-performance powerplants. 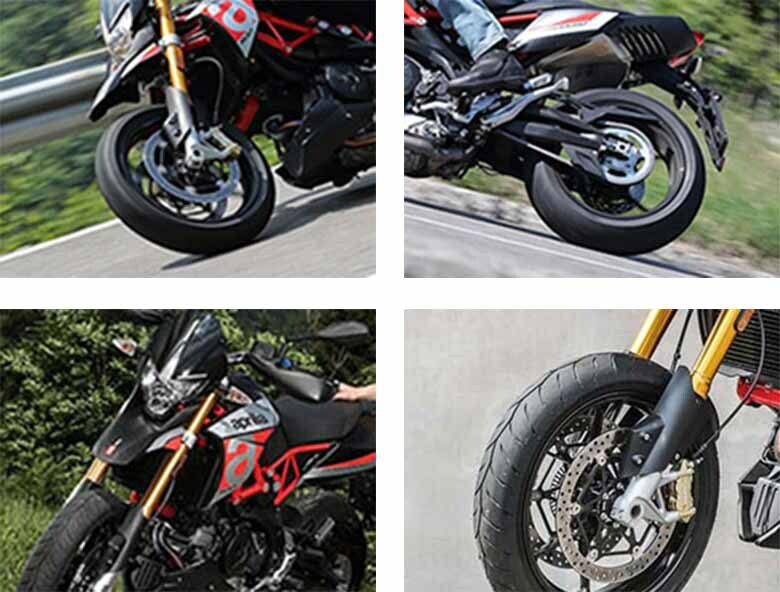 Thanks to the collaboration of Aprilia Racing Department, this new supermoto has earned about 54 world titles in the most challenging conditions, 7 of them were world Supermoto championship. The review of new Aprilia MY2017 Dorsoduro 900 Supermoto with its specifications and pictures are given below. The new Aprilia MY2017 Dorsoduro 900 Supermoto is built to provide the best possible road riding fun. This is achieved by using an advanced technology and particularly efficient chassis architectures combined with the high-performance powerplant. 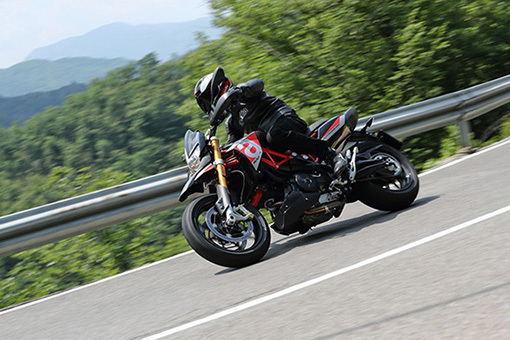 The Aprilia Dorsoduro 900 is the result of solid tradition and true thrill generator. The new original and an innovative technical choices like mixed steel trellis or aluminum plate’s frame guarantees an outstanding handling and better cornering characteristics. The strong 90-degree V-twin engine provides the best throttle response providing the maximum torque and power. The latest electronic management system includes an advanced Ride-by-Wire multi-map accelerator, ABS and traction control. 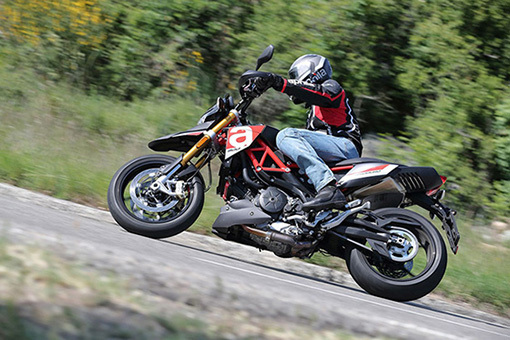 The new Aprilia MY2017 Dorsoduro 900 Supermoto mainly focuses on fun, thrill, and adventure. This is the reason why superstructures are been reduced to the minimum indispensable. The technical parts are designed carefully because they play an important role. The handguards on the handlebars, the number plate on the front and the rear section has been excellently designed. The seat has been carefully designed to ensure that rider receives the best sporty riding experience. The overall compact dimension of supermoto allows the rider to feel free for handling during challenging conditions. The engineers of Aprilia has used the long and flat saddle to ensure the perfect riding position. The tail section is kept more sleek and slender to represent the most aesthetic aspects of Aprilia. It contains the double exhaust allowing for outstanding proportional symmetry and weight distribution. The new frame and the cylinder head covers and the red painted chassis gives an incredible view. The graphics are highlighted by Adrenalinic Silver color scheme. 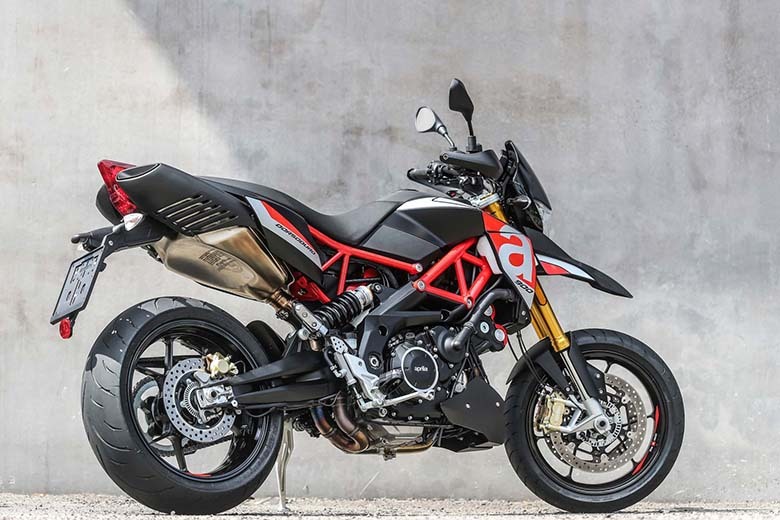 The new Aprilia MY2017 Dorsoduro 900 Supermoto features the powerful 900cc 90-degree V-twin engine offering the more torque and better response than previous models. This engine uses the stroke of 67.4 mm, which have been increased from the previous 56.4 mm while the bore of 92 mm is kept same as previous. This will provide the maximum power of 95.2 HP at 8,750 rpm and the maximum torque of 90 Nm is being achieved at 6,500 rpm. The maximum torque is achieved at higher rpm in 900cc then the previous model. It allows the rider to have an increase in acceleration response and better pick up resulting in the fun ride. The overall design of the engine is kept same i.e. dual cylinders with four valves per cylinder, dual overhead cam are being used with liquid cooling. There are some other changes are taken into consideration regarding reducing frictions by redesigning the piston and by the use of new pins. The crankshaft is also carefully balanced. The use of more efficient semi-dry carter internal lubrication circuit minimizes the losses of power due to shaking and keeps consumption and temperature of the lubricant to the limit by eliminating the need for an oil radiator. The latest engine has the new injectors, which provide an improved fuel/air mixture spray achieved through an increase in the fuel pressure. This will benefit consumers and emissions and it is approved by the Euro 4 standards. The new exhaust system contains the double oxygen sensor. This supermoto is fitted with an automatic decompressor making it an easier to start in all conditions, especially in low-temperature conditions. The load on its clutch has been reduced by 15%, which will increase the comfort level of using the clutch. 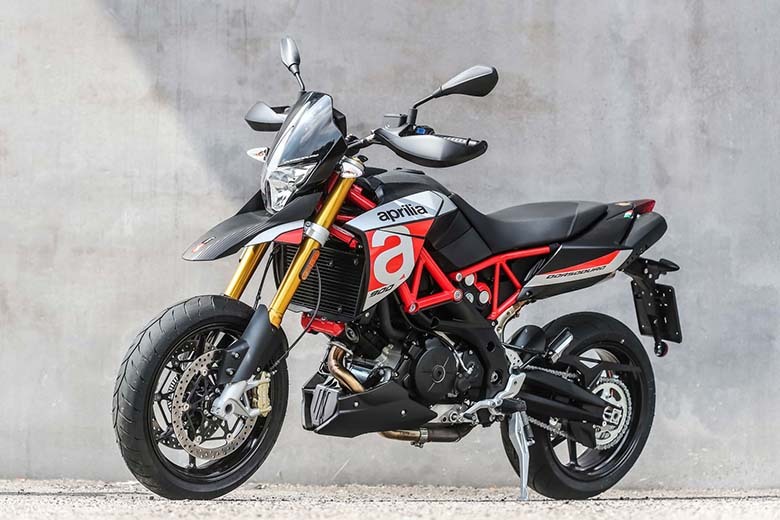 The limited version of about 35 kW of new Aprilia MY2017 Dorsoduro 900 Supermoto is also available for newly licensed riders. 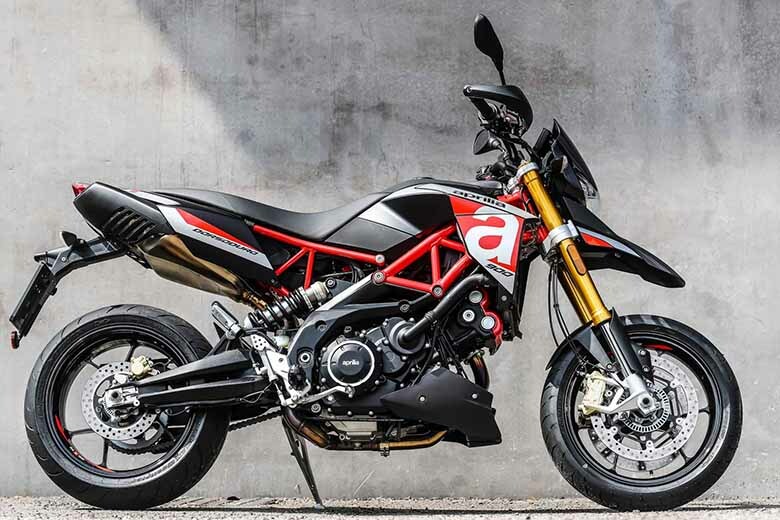 The new Aprilia MY2017 Dorsoduro 900 Supermoto features the latest electronic management system of all times. It uses the more powerful Marelli 7 SM ECU, this same system was also used in V4 bikes as well. This latest system gives the precise management of the mixture of fuel and air. 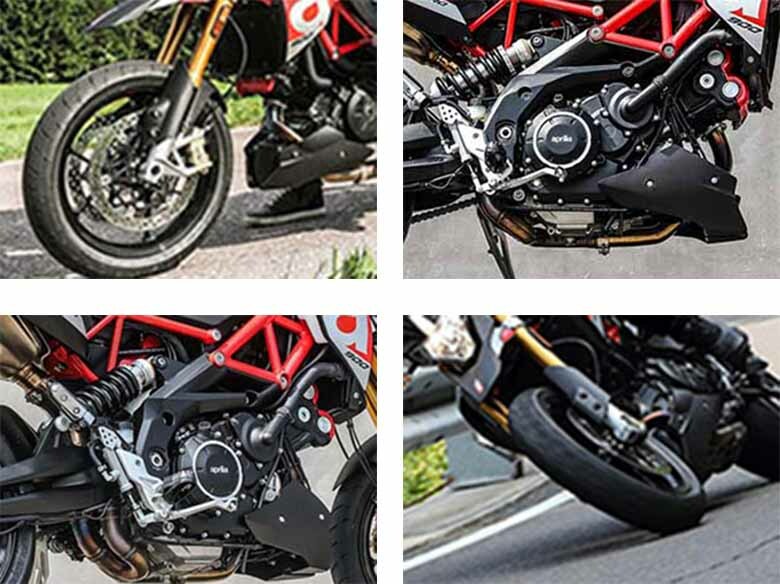 This overall weight of the system has been reduced by 550 grams as compared to the previously used Ride-by-Wire system in Aprilia Dorsoduro 750. This electronic management allows the rider to change the engine mapping. The Sports setting gives an aggressive throttle response while the Touring mode allows the smoother response, which is considered as ideal for daily use. The Rain map reduces the power up to 70 HP and it is best for slippery road surfaces. The rider can easily activate any of the engine maps by simply pressing the button. 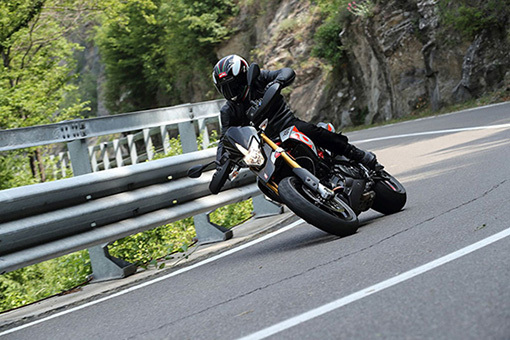 The latest Aprilia Traction Control system with an optimized feature of sensitivity adjustable up to three levels to limit the spin of the rear wheel by acting on an ignition and an injection throttle valves. This system comes with the continental Two-channel ABS system and the ABS feature can also be deactivated as well. The new color TFT digital instrumentation is used to provide all the necessary information about the Aprilia Supermoto. The compact unit of 4.3 inches of the screen contains the plenty of information with the capacity of adapting the background and font color based on the conditions detected by the light sensor. The information displayed contains the speedometer, the coolant temperature, engine map, and clock. The rider can use the Mode joystick, positioned on his left-hand electrical block, to adjust different parameters like traction control, ABS ON and much more. The AMP (Aprilia Multimedia Platform) installation kit comes as an optional, which allows the rider to connect the smartphone to his vehicle. In this way, a rider can view all the data related to incoming or current calls on the screen. The all-new Aprilia MY2017 Dorsoduro 900 Supermoto features an outstanding chassis architecture. The chassis provides an amazing characteristics of efficiency, a balance of tight ride and outstanding precision even in extreme conditions. The frame is carefully developed in racing competitions and some experiences gained from the Supermoto world championship. The Trellis upper part of the steel tubing is been combined with the widespread aluminum lateral plates with high-resistance bolts. This results in the rigid and lightweight structure allowing the rider to have full use of the powerful 900cc engine. The lightweight helps in an efficient controlling of the power while the inclined positioning of the shock absorber gives the smooth riding experience. The new optimum exhaust manifold layout not only looks good but it does not has any impact on the length of the bike and without stressing the shock absorber thermally. The size of an aluminum swingarm has been adjusted in a way to withstand the asymmetrical stress due to the lateral positioning of the shock absorber. It enhances the torsional stiffness and elasticity characteristics for the more comfortable ride. The latest Kayaba fork is about 450 grams lighter than the previous model, they are easy to adjust in spring preload and are capable to withstand any stress of sports riding and absorbing bumps on the road surface. They are responsible to provide greater comfort and control during aggressive riding on tough and rough surfaces. The overall performance of suspension system has been improved due to the use of the new pair of three-split-spoke wheels, which are about 2 kg lighter than the previous model. This helps in the reduction of the gyroscopic effect, which increases the handling and acceleration. The latest braking system provides the best stopping forces. The front end of the supermoto relies on the radial 4-piston calipers and the pairs of 320 mm steel floating discs, which are light in weight and are highly capable to reduce the overall braking distance. The 240 mm of a rear disc comes with the solo piston caliper. Front suspension Upside-down fork, stanchions Æ 41 mm. Adjustable hydraulic rebound damping and spring preload. Wheel travel of 170 mm. Rear suspension Aluminum alloy swingarm. Hydraulic shock absorber with an adjustable extension and spring preload. Wheel travel of 160 mm. Rear: Æ 240 mm stainless steel disc. Single piston caliper. Metal braided brake hose. 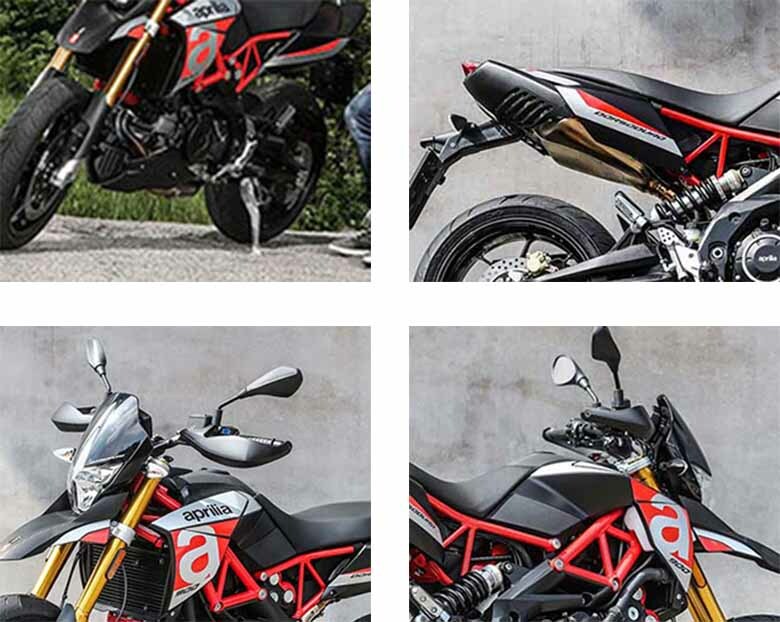 This article is about the full review of new Aprilia MY2017 Dorsoduro 900 Supermoto with its pictures and specifications. This supermoto comes with the 900 ccs powerful engine which has been optimized to deliver the best performance in all conditions. The chassis is kept a light in weight but its strength is unbelievable. It performs well in all tough and harsh conditions. The new Aprilia MY2017 Dorsoduro 900 Supermoto is your ultimate choice for enjoying the thrill ride.